Whenever anybody is searching online for a party bus in Romulus, then they will often have a clear idea in their mind of what it is that they are looking for. Here at Rockstarz Limousine and Party Bus, we specialize in providing our clients with everything that they need and more to ultimately make sure that their party goes off with a bang. Perhaps your main concern with your Romulus party bus rental is making sure that everybody that you want to invite can come along. That’s not a problem with us because we have made full use of the space available to us to allow you to invite even more people than ever before. Also, we have included a number of leather seats allowing your guests to rest while the party continues on around them. Of course, with your Romulus party bus service, the main thing is the party itself and that is where we really do excel. From the moment you all board the bus, you will notice that you are being transported in your very own private nightclub, a space that is going to ultimately provide you with a wonderful time. From the state of the art sound system to the hypnotic laser light show, it will all result in you having a wonderful time in a bus that has the best atmosphere around. There’s no wonder that this kind of experience is then talked about for some time to come. 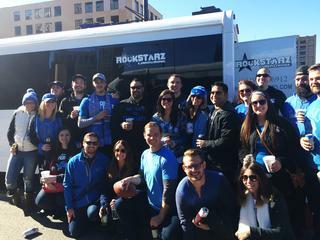 Previously, people have used our party bus to celebrate a number of different occasions. No matter if it is a birthday, an anniversary, or perhaps you just want to have a cool time with friends in a different setting, we can accommodate anything. So, for those that live in the Romulus area and are looking to hire that party bus, then give us a call direct here at Rockstarz Limousine and Party Bus. Alternatively, you can contact us via our website and a member of our team will be in touch ASAP.